Metallic print business cards are exactly what you need to create cards that are truly unforgettable. To create this look, a special printing process is used which prints CMYK colors with a dazzling foil finish. The process involves layering CMYK colors on top of silver ink. This makes it possible to create half tones, gradients, or any other colors and color combinations you need with a foil shimmer. This makes for metallic business card designs that are incredibly striking and memorable. 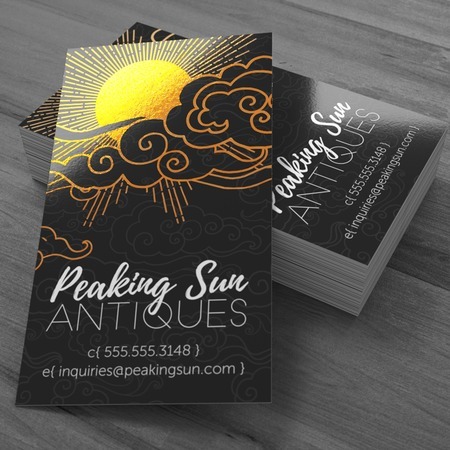 Accent any part of your custom business cards with metallic highlights in any color or color gradient you want. Try adding metallic highlights to your logo or call-to-action to make them really stand out. Metallic print business cards include the standard 2” x 3.5”, as well as our popular 2.5” x 2.5” square cards. We also have finishing options like UV coating to add a high gloss to your metallic print business cards. If you’re looking for an edge in your advertising, print metallic business cards. This product is popular with small to large scale businesses that need an extra shine and sparkle in their business cards. They’re a good choice for anyone who wants to have a truly unique business card.